Open the transaction Marketplace Setup Wizard [OMP06]. Click on Available Marketplaces and choose eBay. Enter an Internal Name for your marketplace > Click the checkbox Activate (if you prefer to choose the read only mode, please click the corresponding checkbox. In this case reybex does not synchronize any data to eBay.) > Click Generate eBay Token. 4. Klick Agree to grant reybex access to your eBay account. 5. Click the green confirmation button to confirm acceptance of the token. 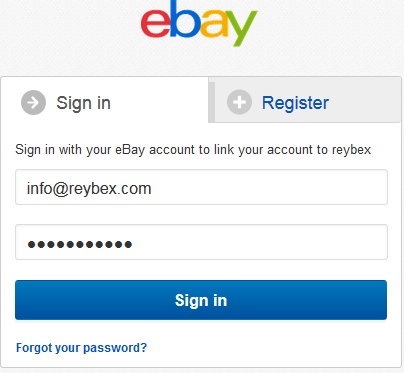 The eBay token will be entered in reybex automatically. 6. Log in to your eBay account > click My eBay > click eBay Account > go to Settings > set the checkmark for Yes > click on confirmation. With the checkmark you activate the function that stocks can be set to "0". 7. Return to your reybex account > click eBay Connection Test > Proceed. Fill in the forms > proceed > click Read categories > proceed > click seller profile import. 8. Click the checkbox Def. Business Policy (concerns: payment conditions, shipping conditions, return conditions). If you have not set this checkbox, enter the conditions for payment, shipping and return policy manually. 9. Click save and start product import. You proceed with the product import manager. You'll find further information about the product import in our documentation Article import from marketplaces / shops. Your products in reybex may only have one defined category (which has to be a leaf-category). Otherwise, eBay won´t accept your products and the synchronisation wont´t ne successful.